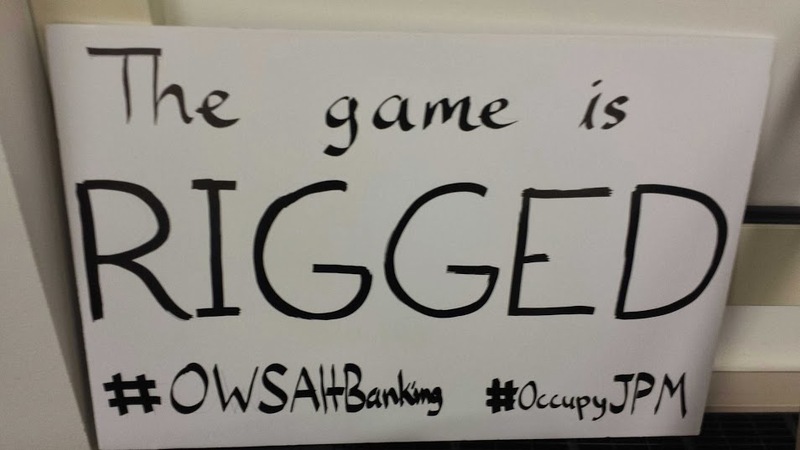 I’m looking forward to protesting in front of JP Morgan with my #OWS Alt Banking group this Wednesday at noon. The exact location is 270 Park Avenue, near 48th Street. It’s part of a “Week of Action” being put together by a broad coalition of activist and labor groups here in New York. The overall theme of the week is to try to communicate to New Yorkers, in this time of transition from Bloomberg to de Blasio, that we can effect positive change in our city. The theme of the day on Wednesday, at least for us, is to “be in the know,” which makes it a bit more positive than other protests we’ve been part of. I think this makes sense. 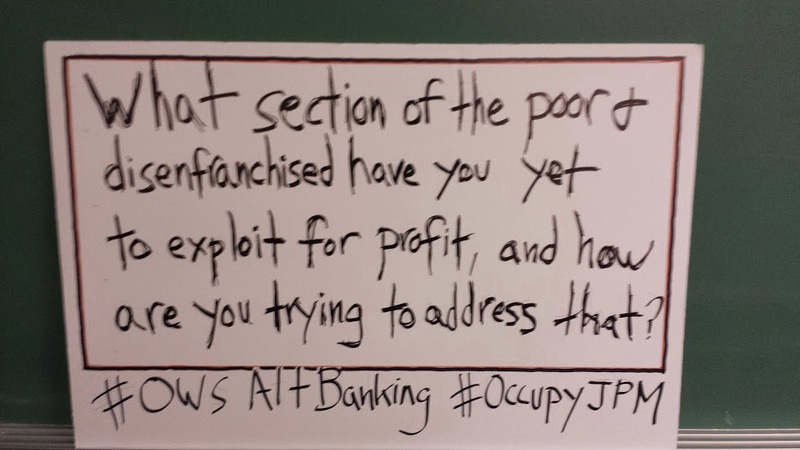 There’s so much widespread distrust and hatred of the big banks at this point that I feel like Occupy’s role has gone from provoking people to be outraged to provoking people to be hopeful. Hopeful about the fact that things could be a whole lot better than this, if we work together. I also made a sign that referenced the London Whale and the risk model, but someone said we might need to give people a copy of our recent book, Occupy Finance, just to understand that sign. Sigh. The facebook page is here, please share it with people who may be able to join us Wednesday! I am enjoying Hanuka in Israel, so the protest will have no immediate impact on me, but I have to ask: How is your stated goal of positive change going to be effected by the negative signs you propose? Will J.P. Morgan say “Thanks. We are going to change.” ? Does De Blasio write banking rules or have regulatory power over banks? Haha no it’s not meant to be positive for Jamie Dimon, it’s meant to be positive for New Yorkers. I’m not holding my breath for bankers to voluntarily change, are you? Thank you for what you are doing, these actions do provide a sense of hope (which is much better for our health than anger). You are an absolute legend. The first sign is funny, but not very accurate. I’ve seen many analyses over 15 years and 7 countries all of which indicated that the poor aren’t profitable customers for the banks and are actively avoided. Grameen Bank even got a Nobel Peace Prize (whatever you think of that) for the revolutionary idea of focusing on banking services for the poor. People with liquid assets are much more attractive customers (they have something worth taking). In theory, the poor have physical labor that can be exploited, but banking has (probably?) never been labor intensive in that sense. Of course, the poor also have mental labor that can be exploited, though it seems that route tends to mean they aren’t poor anymore. Pretty sure lots of people who have lost their homes to foreclosure consider themselves poor. I loved the way that you mentioned that Grameen Bank received a Nobel Peace Prize to prove your point . By the way so was President Obama. He still has people in Guantanamo, on Tuesdays; he decides who lives or who dies (drones) etc……. I guess getting the Nobel Prize is not too impressive these days. You said that the poor aren’t profitable according to those analysts. I want you to say that to the people working in factories in Bangladesh, without them none of the big corporations would be making billions of dollars in profits.